This section details all farms and load balancing services statistics configured. It shows a table with the number of current Established and Pending connections for every GSLB and LSLB farms. ACTIONS. Farm profile of a given farm. View Stats Backends. Displays a list the clients connected for every service defined given a certain farm. SERVICE. Name of farm service the backend belongs to (only for HTTP and GSLB farm profiles). ALIAS. Backend ID in such farm or service. Orange bullet = Means the Backend is on maintenance mode. Established conns. Established connections to such backend (only for LSLB farms). Pending conns. Pending connections to such backend (only for LSLB farms). Enable maintenance. The backend will be put into maintenance mode. 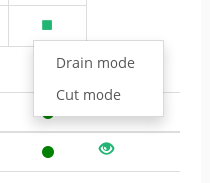 Drain mode: Means no more connections will reach the backend, but already established connections are untouched until they finish. Cut mod: Means all current connections are closed and the backend gets into Maintenance mode immediately and will not acept any other connections. Disable maintenance. The backend will be available for new connections. By default the statistics will show a single sample of the connections found for farms and backends, but it is also possible to take samples every 10, 30, 60 and 120 seconds. You also can manually force a refresh using the refresh icon at the right of the selector.